Hello from sunny South Dakota! Okay so maybe this isn’t an ideal summer destination, but since it’s where M is for his field season it’s where I find myself every couple months. Pro tip: when traveling make sure you bring a computer with an SD card reader…my new work MacBook is lacking in useful ports and I just have to say it’s a good thing M was around to let me use his computer. But I digress; let’s move back to food. Sweet potatoes are used heavily in fall and winter dishes, but are often skipped during the summer months. This is a terrible mistake I’m here to help you rectify. As someone who lives alone most of the year but still buys sweet potatoes at Costco, I can easily eat them for every meal of the day. This recipe has the wonderful bonus of letting me have them as a mid-afternoon snack as well, which is how I spent a pleasant afternoon on a lawn in Lead. It was a long time before I started to enjoy hummus and at first I really only liked the flavored ones, with roasted red pepper being my favorite. At this point I pretty much like all of them (excepting avocado hummus, because my “crazy” palate thinks avocados are awful) but this one is definitely my newest favorite. Chipotle and sweet potato is one of my favorite combinations and it is as excellent as ever in this one. 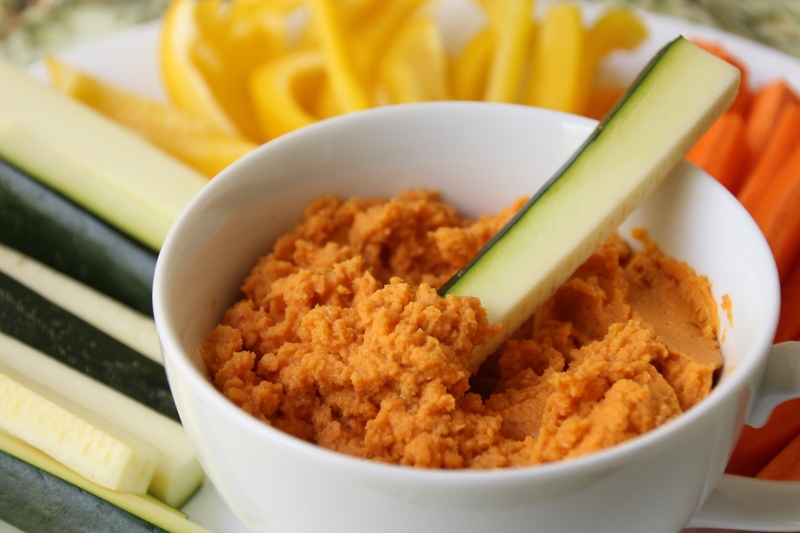 The standard creamy hummus texture is packed full of sweet potato, complimented by smoky and spicy adobo chipotle peppers. My low spice tolerance and I kept our version quite mild, but this recipe is supremely easy to kick it up if spicy is your thing. My version used one pepper and two tablespoons of adobo sauce, so add more of each and/or some ground chipotle if you really want it spicy. 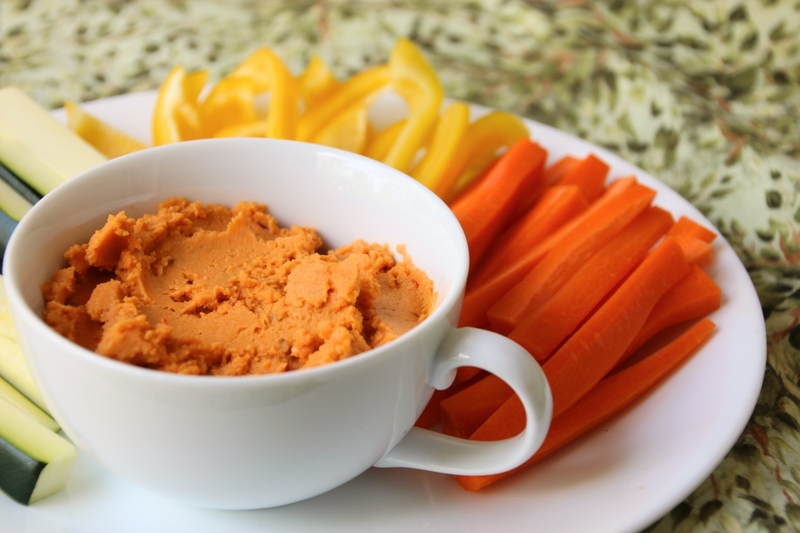 This hummus pairs well with pretty much anything, but carrots and bell peppers turned out to be my favorite. It’s also great on a wrap or sandwich if you want to use it in more of a main dish. Its deliciousness makes it easy to eat the rainbow of vegetables any time of year, but I’m looking forward to having it with carrots right out of the garden later this summer. Admittedly I don’t currently own a full-size food processor and I borrowed one to make this hummus (thanks Amanda! ), but this might be the recipe that convinces me I need my own. Combine all ingredients except sweet potatoes, starting with 1 pepper and 1 Tbsp adobo sauce, in a 7-cup food processor. Pulse until mixed, scraping the sides at least twice. Add sweet potatoes and process for at least one minute, scraping the sides again, until mixture is smooth. Taste and add another pepper, more adobo sauce, or additional spices as necessary, processing again for 30-60 seconds if you do. 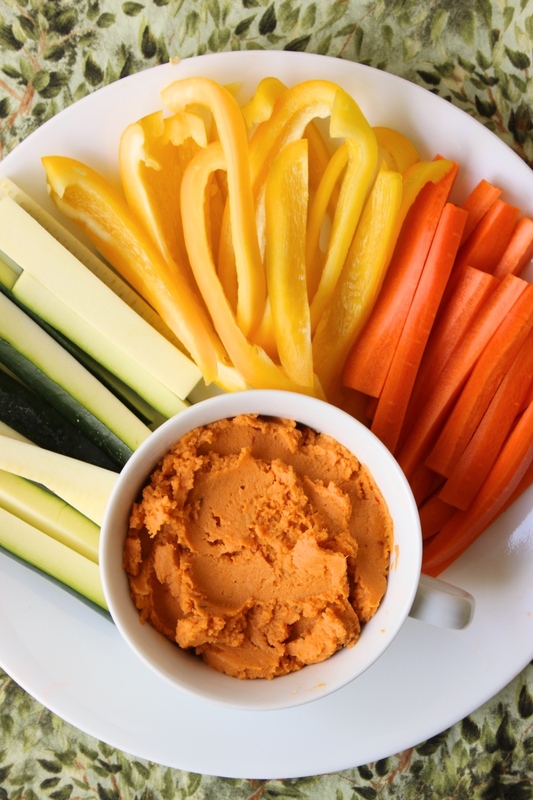 Serve with your favorite veggies or crackers, and store leftovers in the refrigerator. 1 To make puree: scrub 2 large sweet potatoes and stab a few holes in them. Bake at 400 degrees Fahrenheit for 40-60 minutes, or until easily pierced with a fork. Let cool about 10 minutes, then remove skin and mash with a fork. Let cool to at least room temperature before using in hummus (overnight, if you want to do this part ahead of time) or plan on letting your hummus chill in the fridge for an hour or two after you make it.